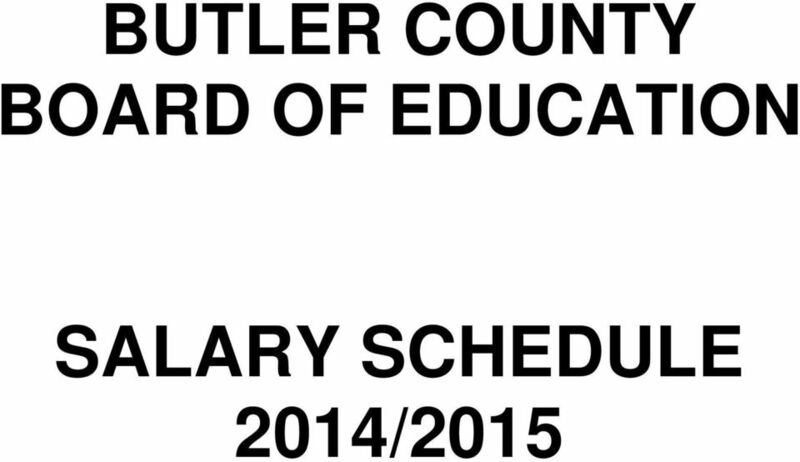 Download "BUTLER COUNTY BOARD OF EDUCATION SALARY SCHEDULE 2014/2015"
2 TEACHER BUTLER COUNTY SCHOOLS TOTAL YEARS PUBLIC SCHOOL EXP. 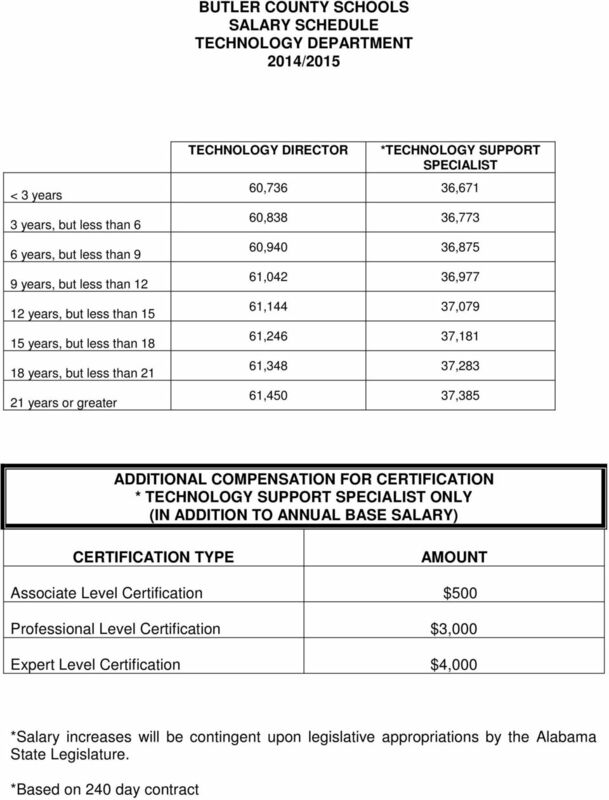 187 Day Contract BACHELOR MASTER 6 YEAR (AA) DOCTORAL NON- DEGREE <3 YRS 36,867 42,395 45,714 49, <6 YRS 40,551 46,634 50,283 53,935 40,551 <9 YRS 42,327 48,675 52,499 56,295 42,327 <12 YRS 42,894 49,329 53,191 57,051 42,894 <15 YRS 43,674 50,223 54,155 58,088 43,674 <18 YRS 44,670 51,371 55,391 59,409 44,670 <21 YRS 45,247 52,032 56,105 60,179 45,247 <24 YRS 45,825 52,699 56,822 60,947 45,825 <27 YRS 46,370 53,245 57,370 61,494 46, YRS 46,917 53,792 57,916 62,040 46,917 The anniversary date of employment shall be used to determine the appropriate step for experience. 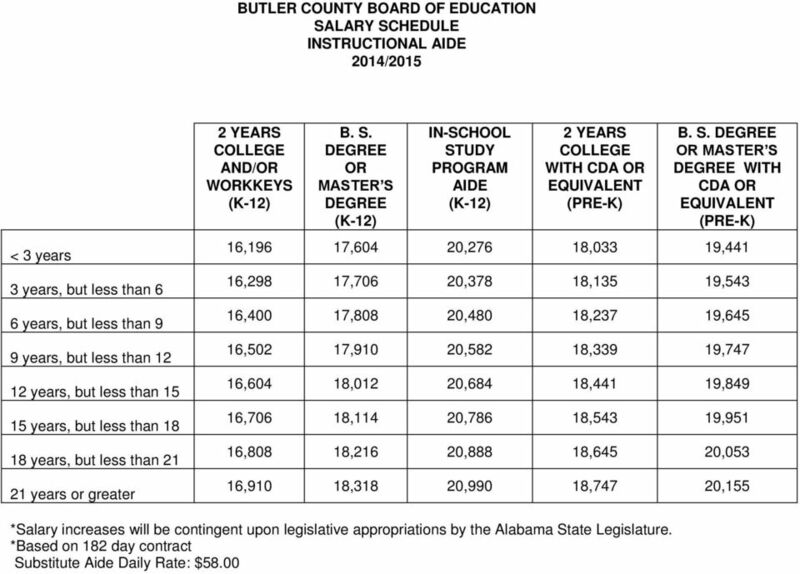 A teacher is entitled to be paid at the higher degree level with the monthly pay period that begins after the State Superintendent recognizes the advanced degree. 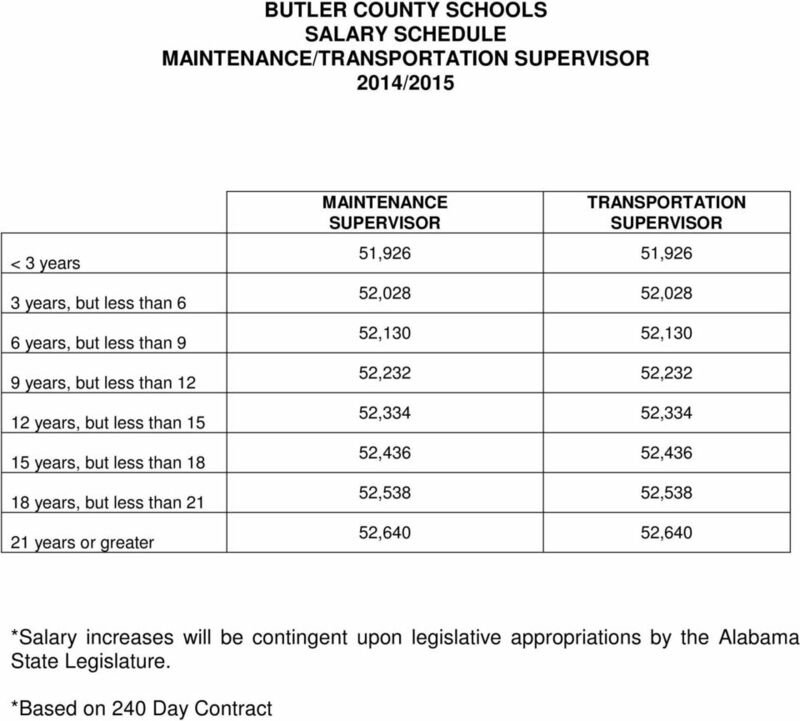 If the school year has ended, the increase in pay will become effective at the beginning of the next school year unless a teacher s contract exceeds nine months. SUBSTITUTE TEACHER : DAILY RATE $58.00 SUBSTITUTE TEACHERS WHO ARE CERTIFIED BY THE STATE DEPARTMENT OF EDUCATION, ARE ELIGIBLE FOR CERTIFICATION OR HOLD A MINIMUM OF A BACHELOR S DEGREE MAY BE PAID ACCORDING TO THE TEACHER SALARY MATRIX WHEN THEY SUBSTITUTE TWENTY (20) CONSECUTIVE DAYS OR MORE FOR THE SAME TEACHER. 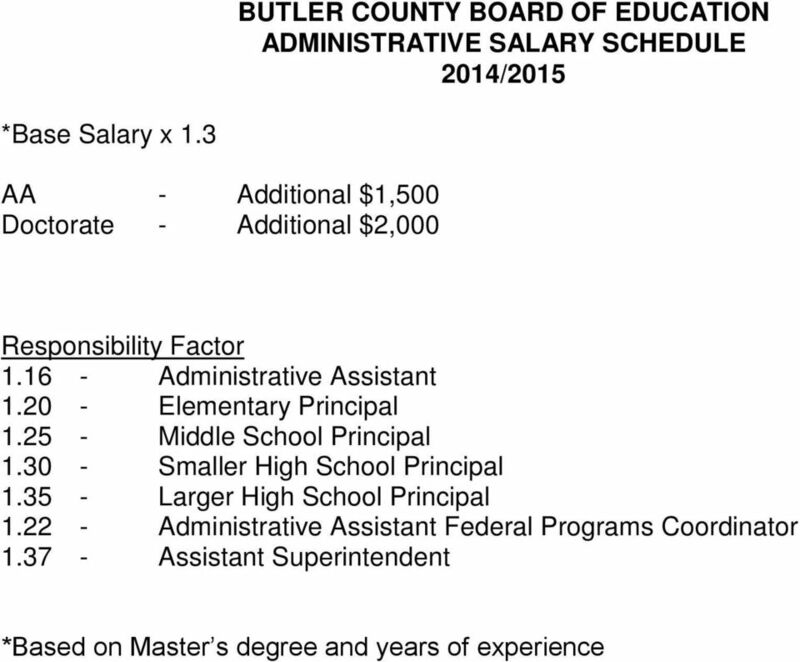 6 BUTLER COUNTY SCHOOLS ASSISTANT PRINCIPALS GRADE LEVEL: ELEMENTARY: K - 6 TEACHER S SALARY - 11 MONTHS MIDDLE LEVEL: 5-8 TEACHER S SALARY - 11 MONTHS + $50.00 PER MONTH SECONDARY LEVEL: 9-12 THE ENROLLMENT OF LOWER GRADE LEVELS ATTACHED TO SECONDARY SCHOOLS WILL BE INCLUDED IN TOTAL ENROLLMENT. THIS INCLUDES K - 12 SCHOOLS. ENROLLMENT MASTER S DEGREE AA/EDS. 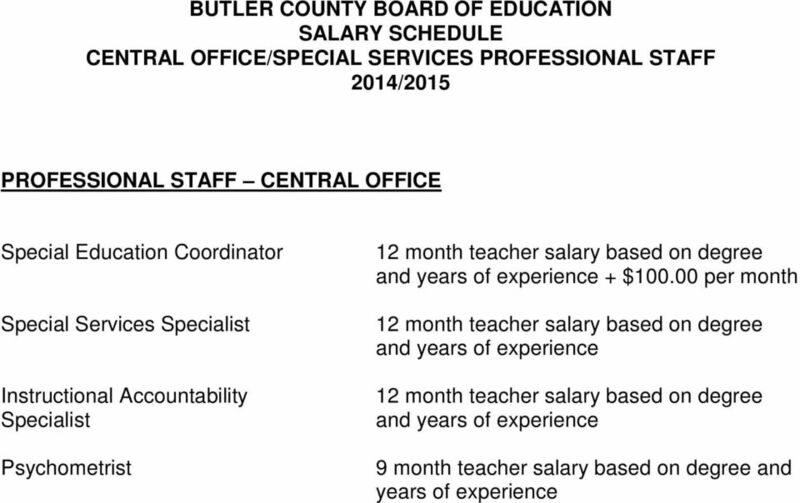 DEGREE TEACHER S SALARY - 11 MONTHS + $75.00 PER MONTH 601 AND ABOVE TEACHER S SALARY - 11 MONTHS + $ PER MONTH. 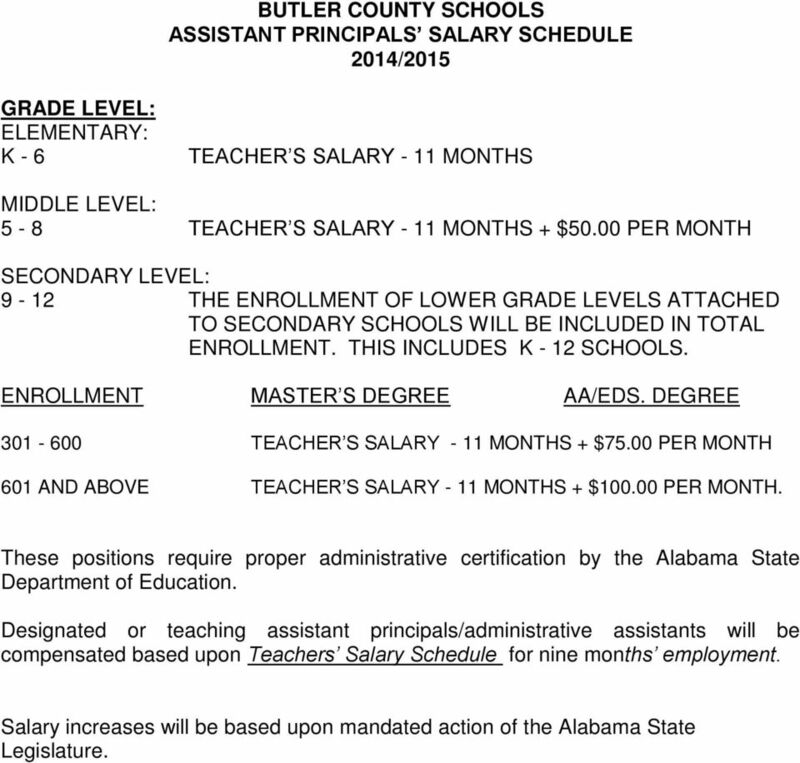 These positions require proper administrative certification by the Alabama State Department of Education. 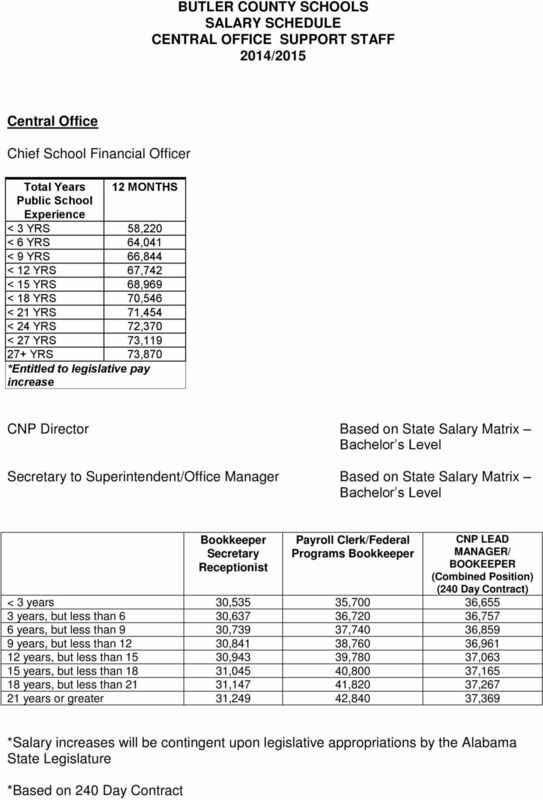 Designated or teaching assistant principals/administrative assistants will be compensated based upon Teachers Salary Schedule for nine months employment. 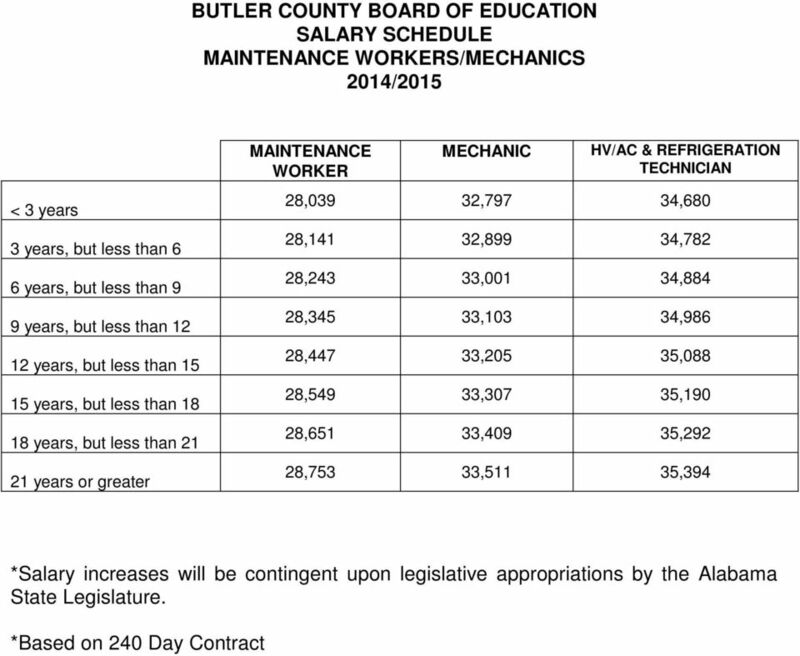 Salary increases will be based upon mandated action of the Alabama State Legislature. 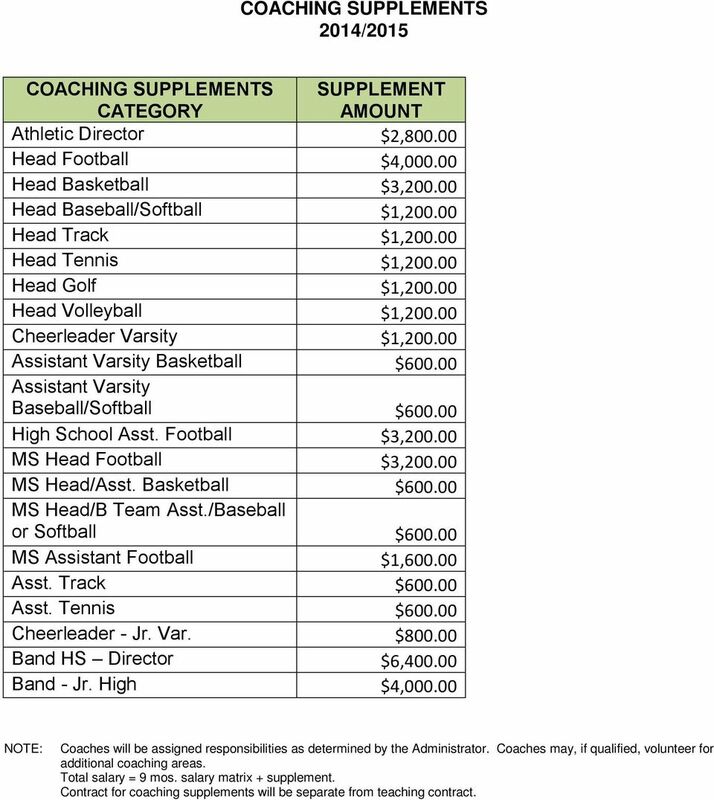 7 COACHING SUPPLEMENTS COACHING SUPPLEMENTS CATEGORY SUPPLEMENT AMOUNT Athletic Director $2, Head Football $4, Head Basketball $3, Head Baseball/Softball $1, Head Track $1, Head Tennis $1, Head Golf $1, Head Volleyball $1, Cheerleader Varsity $1, Assistant Varsity Basketball $ Assistant Varsity Baseball/Softball $ High School Asst. Football $3, MS Head Football $3, MS Head/Asst. 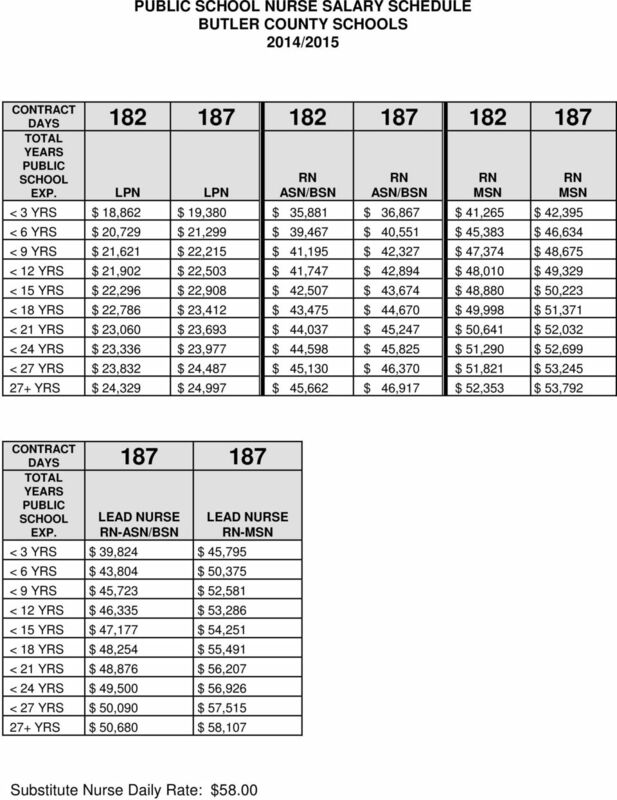 Basketball $ MS Head/B Team Asst./Baseball or Softball $ MS Assistant Football $1, Asst. Track $ Asst. Tennis $ Cheerleader - Jr. Var. $ Band HS Director $6, Band - Jr. High $4, NOTE: Coaches will be assigned responsibilities as determined by the Administrator. Coaches may, if qualified, volunteer for additional coaching areas. Total salary = 9 mos. salary matrix + supplement. Contract for coaching supplements will be separate from teaching contract. 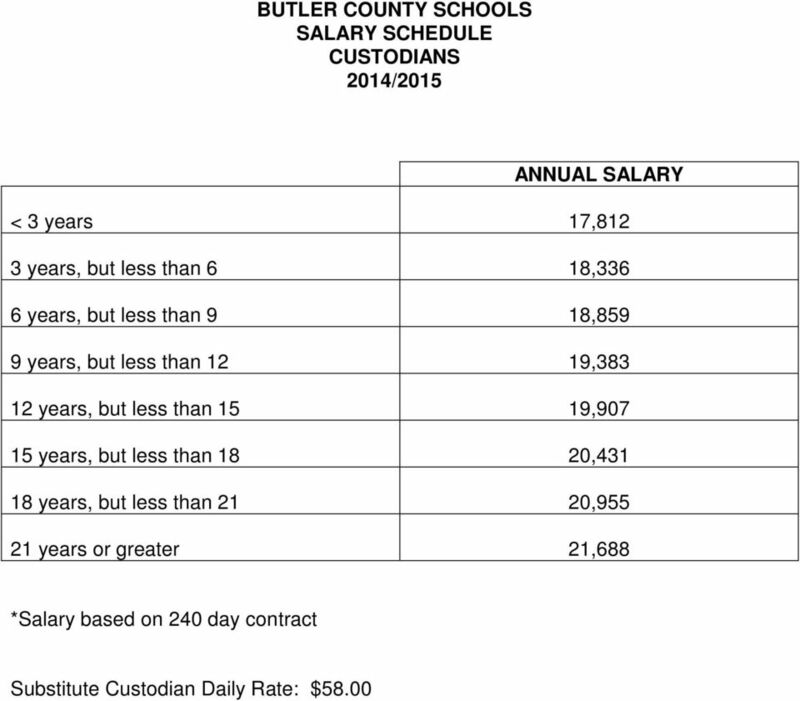 8 BUTLER COUNTY SCHOOLS FOR BUS DRIVERS/UTILITY WORKER ANNUAL SALARY < 3 years $13,718 3 years, but less than 6 $13,820 6 years, but less than 9 $13,921 9 years, but less than 12 $14, years, but less than 15 $14, years, but less than 18 $14, years, but less than 21 $14, years or greater $14,431 Substitute Bus Driver $35.00 per day Salary increases will be based upon mandated action of the Alabama State Legislature. 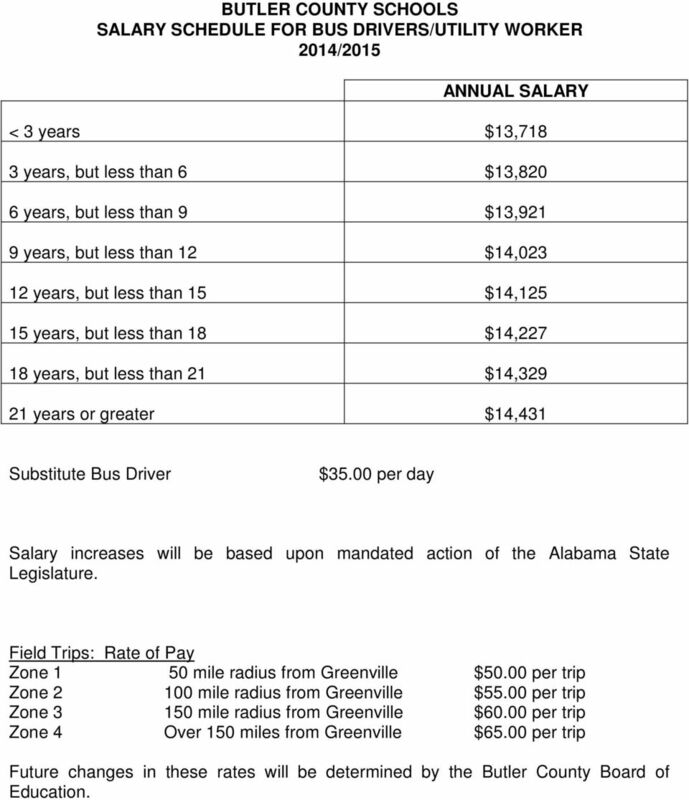 Field Trips: Rate of Pay Zone 1 50 mile radius from Greenville $50.00 per trip Zone mile radius from Greenville $55.00 per trip Zone mile radius from Greenville $60.00 per trip Zone 4 Over 150 miles from Greenville $65.00 per trip Future changes in these rates will be determined by the Butler County Board of Education. 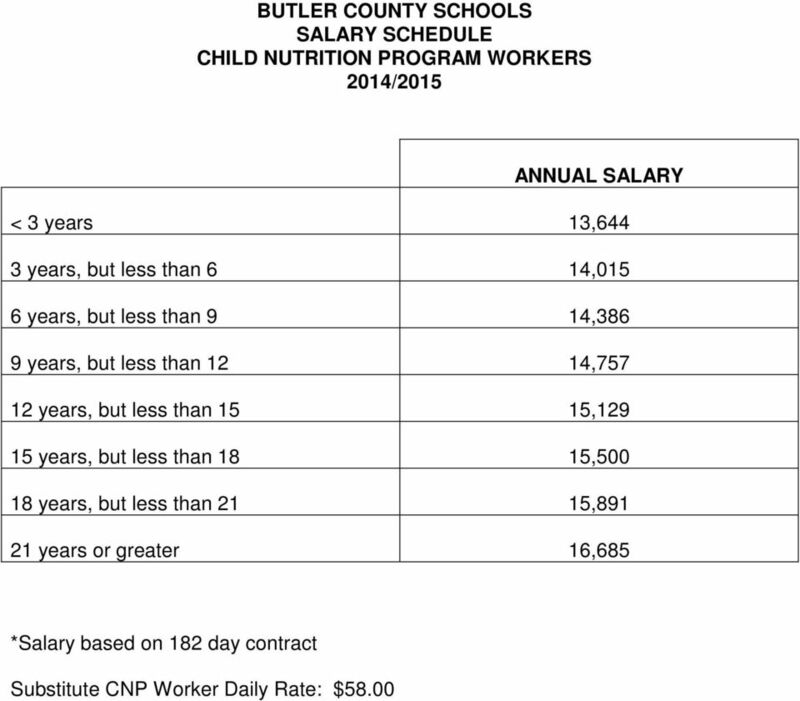 9 BUTLER COUNTY SCHOOLS CHILD NUTRITION PROGRAM MANAGERS The minimum starting salary for cafeteria managers shall be based upon the total enrollment of the schools served by that cafeteria. 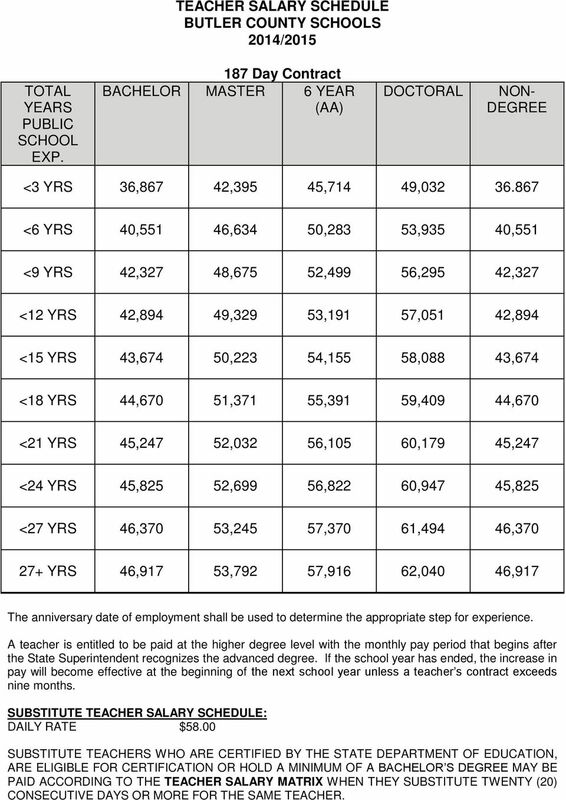 The following ranges shall be used to determine salaries. 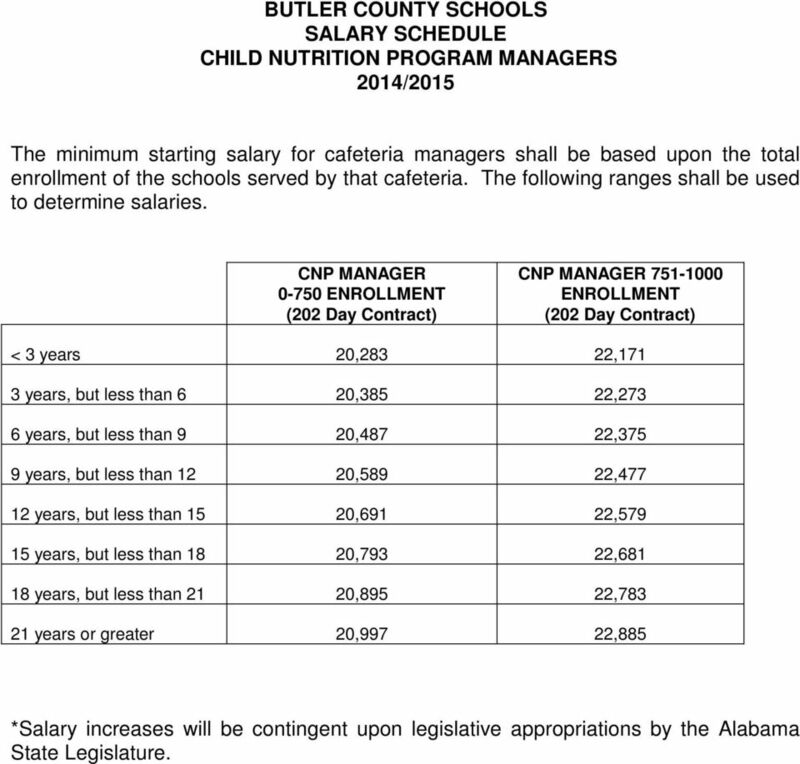 CNP MANAGER ENROLLMENT (202 Day Contract) CNP MANAGER ENROLLMENT (202 Day Contract) < 3 years 20,283 22,171 3 years, but less than 6 20,385 22,273 6 years, but less than 9 20,487 22,375 9 years, but less than 12 20,589 22, years, but less than 15 20,691 22, years, but less than 18 20,793 22, years, but less than 21 20,895 22, years or greater 20,997 22,885 *Salary increases will be contingent upon legislative appropriations by the Alabama State Legislature. 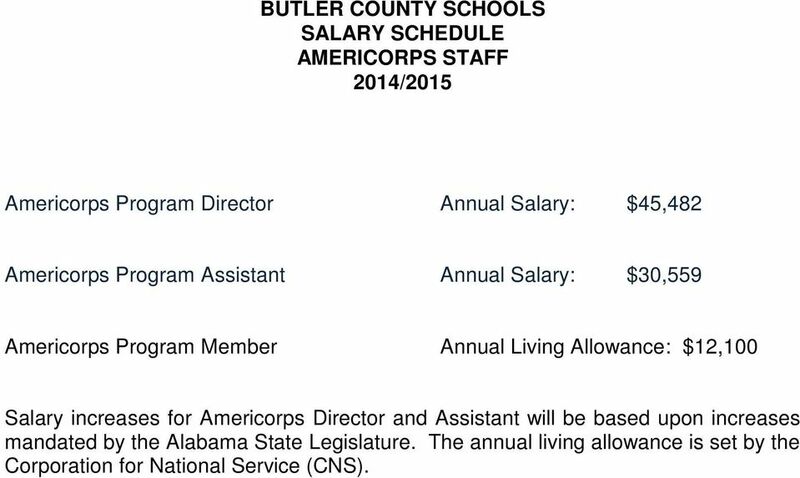 18 BUTLER COUNTY SCHOOLS AMERICORPS STAFF Americorps Program Director Annual Salary: $45,482 Americorps Program Assistant Annual Salary: $30,559 Americorps Program Member Annual Living Allowance: $12,100 Salary increases for Americorps Director and Assistant will be based upon increases mandated by the Alabama State Legislature. The annual living allowance is set by the Corporation for National Service (CNS). 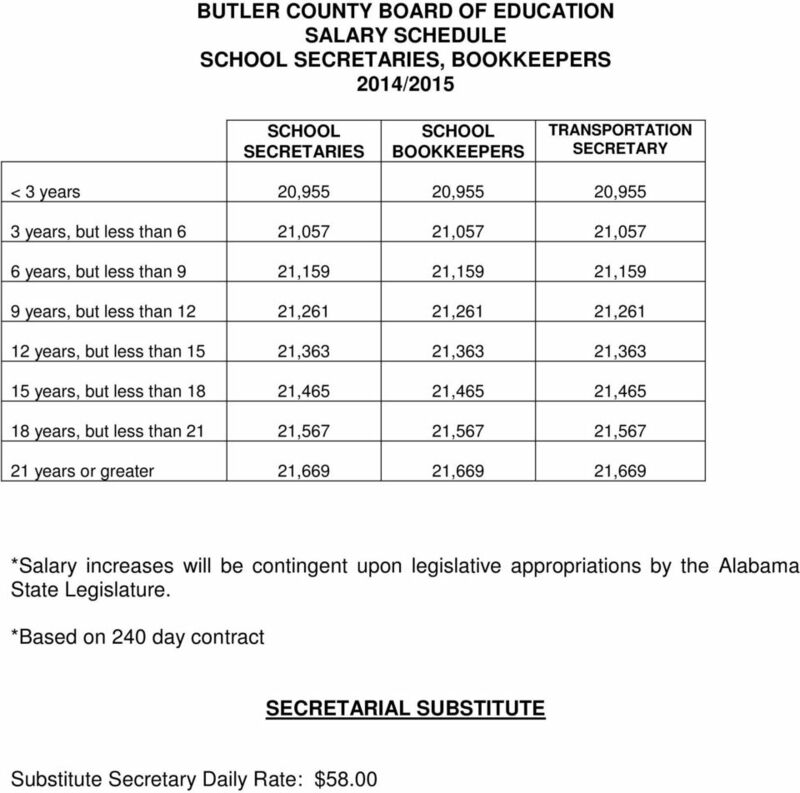 Understanding Alabama Schools Accounting System. A Guide to State Allocation Calculations 2013-2014 3/4/2014. Funding Components.